So, I have to say, being a reader and proponent of graphic novels, I was pretty excited to try out these toddler-safe ones, sent to me for review by Oni Press. I've never watched the t.v. show these are based on (though I have seen the song, "there's a party in my tummy") I was glad that there were introductions made in Gabba Ball. 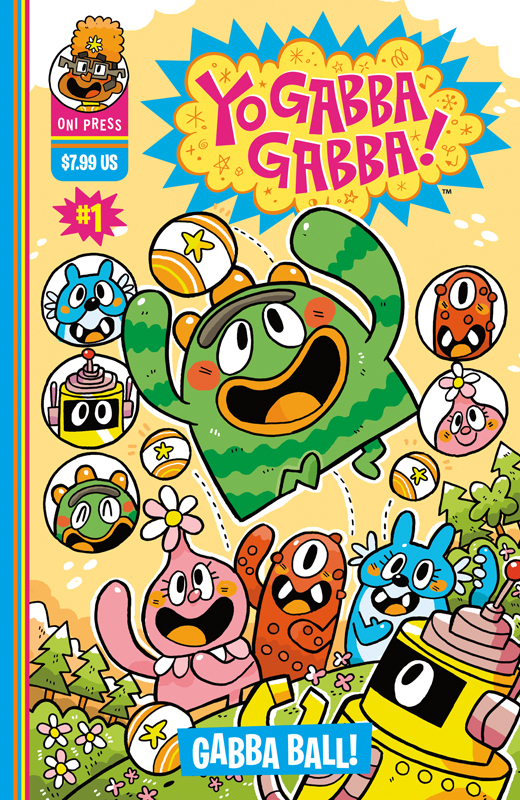 The characters each say their name and an action as they play Gabba Ball. Muno likes to bounce, Foofa likes to roll, Toodee likes to kick, and so on. 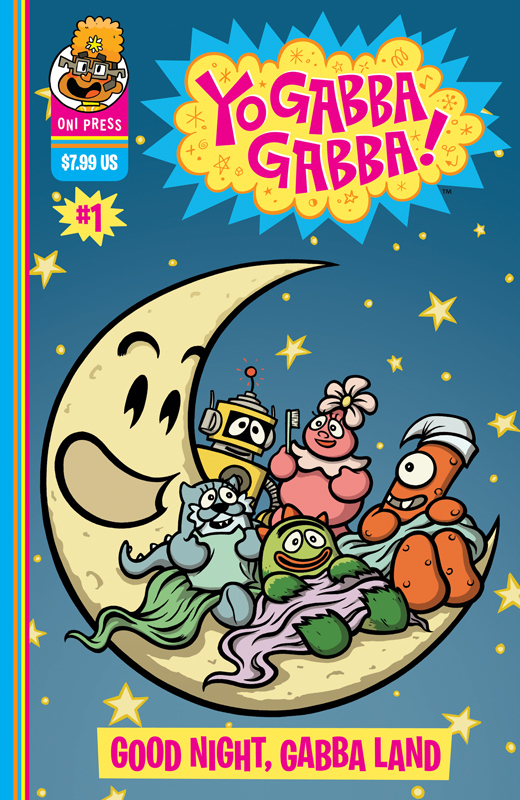 With all these great action words, I loved reading Gabba Ball to my 3 year old one snowy day. It made for a great activity: read this book, then play the game! This morning I read Goodnight Gabbaland at least three times with my 1 year old. It is his favorite, and I like it best, too. In it, the inhabitants of Gabbaland prepare for bed by cleaning up, brushing teeth and reading a story. The art is less stylized and more realistic than the art in Gabba Ball (you can see the difference on the covers). I also like the rhyming text which is repetitive, easy to parse, and catchy. This would be the easier of the two for an emerging reader to tackle on his own. The idea of panels in children's books isn't really new, apparently. Since board comics have been on my mind, I noticed paneled art in Richard Scarry's books. And I'm sure there are other examples aplenty. But here's the thing, none are so sturdy as the board book. And sturdy is important at this house. These are the first board comics I've come across -- I hope to see more! UPDATE 3/28/16: These continue to be popular with my kids, four years later. They're getting quite worn on the spines, but still holding up otherwise! I'm going to add an affiliate link so you can shop for these on Amazon. Looks like they've only got used copies, now.